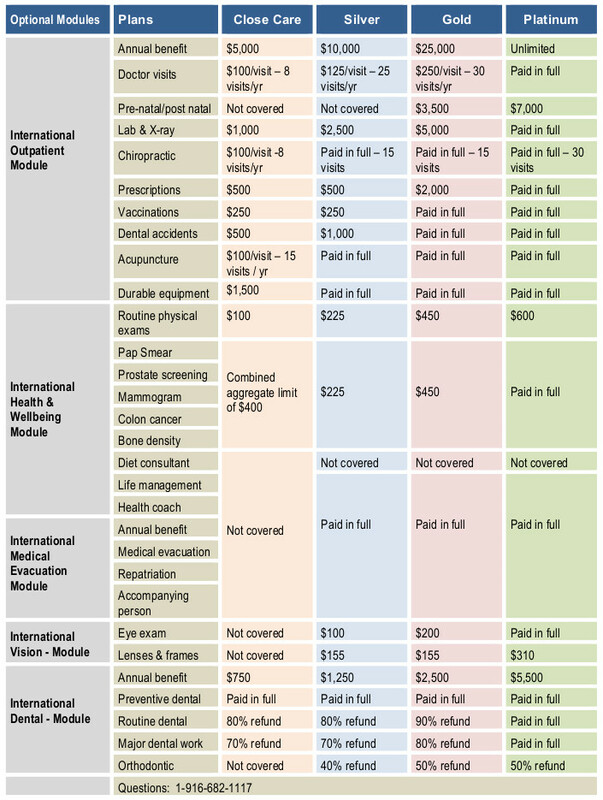 The new Cigna Global Close Care plan is specifically designed to meet the needs of the person or family needing long-term international medical insurance for their destination country along with their resident country. A very price competitive plan for the person planning on relocating to a new country and only need your health care covered in that country, as well as temporary trips home to visit family and friends – this is the plan for you. Perhaps you are an independent contractor or employee on a long-term work assignment in a foreign country, or a student moving for the first time to a far away country. Retirement is here and you plan on moving to a new country, or simply a family living abroad. 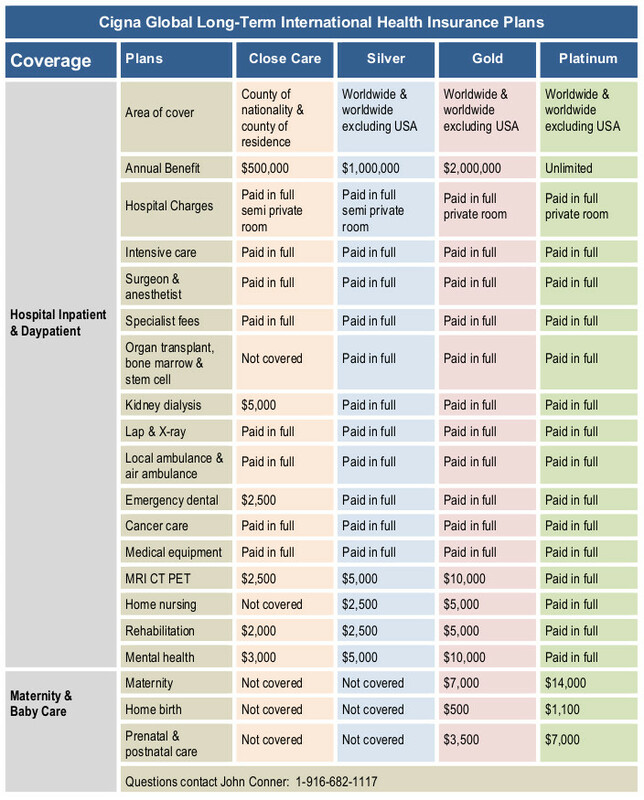 International medical coverage in your resident country along with care in your destination country. Also a limited coverage limit anywhere worldwide for emergency coverage. Outpatient Care (optional): Dr visits and consultations, prescriptions, pathology and radiology, x-ray, physiotherapy (physical therapy), Chiropractic, acupuncture and Chinese medicine, rental and durable equipment, adult vaccinations, dental accidents, child immunizations, annual exams (routine and preventive). With a Cigna Global Close Care policy we will cover you comprehensively when you need us most. With Close Care, you will always have access to our Global Health Assist Service. This is provided by our Clinical Team who offer you expert help and information through your treatment journey and time with Cigna Global, ensuring you have clinical guidance and support every step of the way. We are here for you 24/7. We’re always on call, speak to a medical professional anytime any day. Access to a global network of over 1 million trusted doctors, clinics and hospitals. We offer direct access to some of the best doctors and hospitals in the world. Over 30 years’ experience in providing global health insurance. Today we have 86 million customer relationships in over 200 countries. With a workforce of over 37,000 people looking after our members, plus a medical network of over 1 million partnerships, which include 89,000 behavioral health care professionals, and 12,000 facilities and clinics. Access online doctors’ consultations for non-emergency situations, health assessments, progress trackers, and much more. Schedule a same-day consultation by phone or video. Receive personalized advice to improve your health. Connect with a personal wellness coach. Measure and monitor your health with Cigna Health Assessment. Along with the Cigna Global Close Care plan, we also have three other long term plans to choose from; the Silver, Gold and Platinum plans. You can read about them here. You can choose to pay for your premiums on a monthly, quarterly or annual basis. You can make payments by debit or credit card, or if you pay annually, you can pay by bank wire transfer. If you would like more information regarding the Close Care plan or any of the other Cigna Global International health insurance plans, please feel free to contact me anytime.